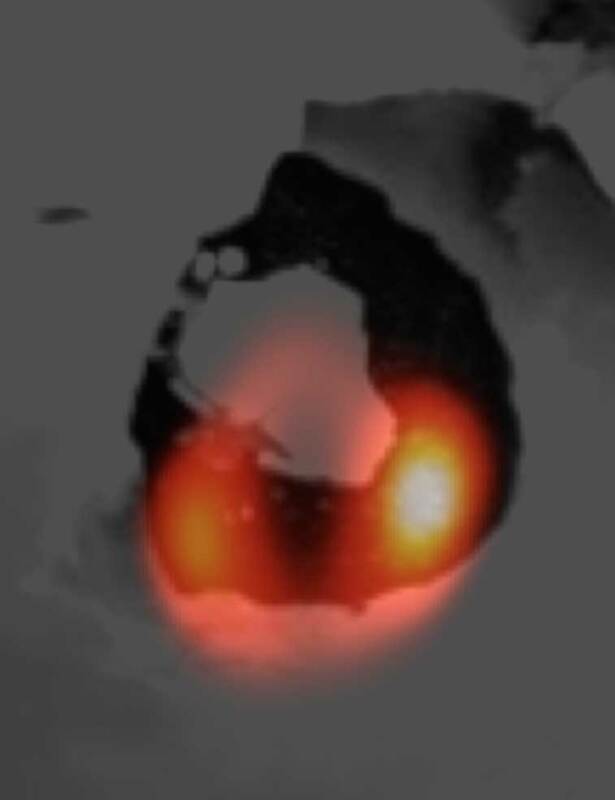 With the first detailed observations through imaging interferometry of a lava lake on Io, a moon of Jupiter and the volcanic epicenter of our Solar System, the Large Binocular Telescope Observatory places itself as the forerunner of the next generation of Extremely Large Telescopes. Io, the innermost of the four moons of Jupiter discovered by Galileo in January 1610, is only slightly bigger than our own Moon but is the most geologically active body in our solar system. Hundreds of volcanic areas dot its surface, which is mostly covered with sulfur and sulfur dioxide. The largest of these volcanic features, named Loki after the Norse god often associated with fire and chaos, is a volcanic depression called patera in which the denser lava crust solidifying on top of a lava lake episodically sinks in the lake, yielding a rise in the thermal emission which has been regularly observed from Earth. Loki, only 200km in diameter and at least 600 million km from Earth, was, up to recently, too small to be looked at in detail from any ground based optical/infrared telescope. With its two 8.4 m mirrors set on the same mount 6 m apart, the Large Binocular Telescope (LBT), by combining the light through interferometry, provide images at the same level of detail a 22.8 m telescope would reach. Thanks to the Large Binocular Telescope Interferometer (LBTI), an international team of researchers was able to look at Loki Patera, revealing details as never before seen from Earth; their study is published today in the Astronomical Journal (link here). "We combine the light from two very large mirrors coherently so that they become a single, extremely, large mirror,” says Al Conrad, the lead of the study and a Scientist at the Large Binocular Telescope Observatory (LBTO). “In this way, for the first time we can measure the brightness coming from different regions within the lake." The LBT image above of Loki Patera (orange ) laid over a Voyager image of the volcanic depression.The emission (in orange color) appears spread out in the north-south direction due to the telescope point-spread function; it is mainly localized to the southern corners of the lake. (LBTO- NASA). A raw LMIRcam image of Io below shows the fringes on Loki Patera (bright spot) and on fainter active volcanic areas. LMIRcam, the camera recording the images at the very heart of LBTI in the 3 to 5 micrometers near-infrared band, was the thesis work of Jarron Leisenring as graduate student at the University of Virginia. For Leisenring, now an instrument scientist for NIRCam (the Near InfraRed CAMera for the James Webb Space Telescope) at Steward Observatory, "these observations mark a major milestone for me and the instrument team. LMIRcam has already been very productive these past few years; now, interferometric combination provides the last step in harnessing LBTI’s full potential and enabling a whole host of new scientific opportunities." "Studying the very dynamic volcanic activity on Io, which is constantly reshaping the moon 's surface, provides clues to the interior structure and plumbing of this moon," remarked team member Chick Woodward of the University of Minnesota, "helping to pave the way for future NASA missions such as the Io Volcano Observer. 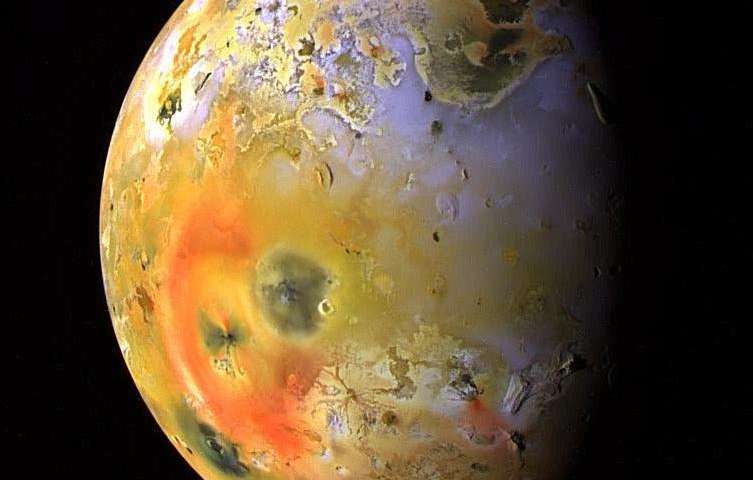 Io's highly elliptical orbit close to Jupiter is constantly tidally stressing the moon, like the squeezing of a ripe orange, where the juice can escape through cracks in the peel." Christian Veillet, Director of the Large Binocular Telescope Observatory (LBTO), observes that: "While there is still much work ahead to make the LBT/LBTI combination a fully operational instrument, we can safely state that the Large Binocular Telescope is truly a forerunner of the next generation of Extremely Large Telescopes slated to see first light in a decade (or more) from now." With plumes of matter rising up to 186 miles (300 km) above the surface, Io is considered a prime candidate as a hotspot for extreme extraterrestrial life.